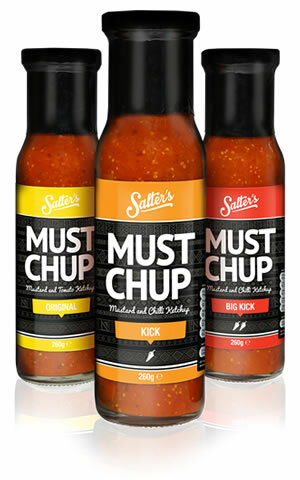 ​Salter’s Must Chup is the brain child of two brother’s (twins) from East Anglia Mark and Andrew Salter who both trained at Colchester Institute. Mark as a Chef and Andrew in Hotel Management. Following on from a sauce launched in the USA by Mark, both twins decided to bring the idea of a Mustard and fresh tomato Ketchup sauce back to the UK and create a similar product using the same Mustards as Mark however adding Dijon mustard for the continental market and fresh tomato sauce instead of manufactured tomato Ketchup. Hence Must Chup ‘Original’ was born. Mark and Andrew saw some immediate benefits in its uses and versatility as a dip, marinade, side sauce and ingredient. They also made sure it was gluten free and vegan/vegetarian friendly as this was an increasing market in the UK. Two years ago they also saw a growing trend for Chilli Ketchup’s and as many of their customers were asking what they were going to launch next they decided to create two Chilli sauces still with a mustard and fresh tomato sauce base and called them Must Chup ‘Kick’ and Must Chup ‘Big Kick’. Hence the Must Chup sauce range was launched. ​​​The Must Chup sauce range includes Must Chup ‘Original’ which has no heat and is perfect for non-chilli lovers and children. Must Chup ‘Kick’ has gentle Jalapeño heat and is ideal for those people who are starting the Chilli journey and do not like too much heat. Normally those with a more delicate palate. Finally there is Must Chup ‘Big Kick’ which has the addition of intense habanero chilli heat and is more suited to the chilli lover. However we do emphasise that we are not just about heat. The sweet flavour of the fresh tomatoes and delicate tastes of the mustards as well as the smoky habanero flavour is the overriding difference from most other chilli sauces. All of the Must Chup sauces can be used as a marinade for fish, meat and vegetarian dishes as well as a side sauce with sausages, burgers, chicken, omelette, steak and many more traditional dishes. They can also be used as a dip using tortilla chips or an ingredient in bolognaise, stews, pasta dishes, soups, cheese on toast and many more to name but a few. ​Must Chup is an all year round sauce, however when the BBQ season is here it is the perfect condiment sauce for alfresco dining. Must Chup can be bought online through the Must Chup website, from Farm shops, deli’s, cafés or at the many shows and markets they attend which are featured in their calendar of events also on their website.